North Korea fired dozens of artillery shells at the South’s Yeonpyeong Island near the border, killing at least two South Korean soldiers and injuring 16 others, the Joint Chiefs of Staff said Tuesday. In response, the South Korean military immediately fired back 80 shells with its K9 self-propelled howitzers toward the North’s western artillery bases in Gaemeori and Mudo, it said. “As the North fired coastal artillery shells at around 2:34 p.m. into waters off the Yeonpyeong Island as well as on the island, we immediately fired back in full accordance with combat rules,” said Lee Hong-kee, chief director for joint operations at the JCS, in a press briefing. As of 9:30 p.m., two South Korean marine soldiers were killed while six others were seriously injured. Ten other soldiers and three civilians on the border island of some 2,000 residents suffered minor injuries, according to the JCS. The North began firing from 2:34 p.m. to 2:55 p.m. and again from 3:11 p.m. until 3:42 p.m. 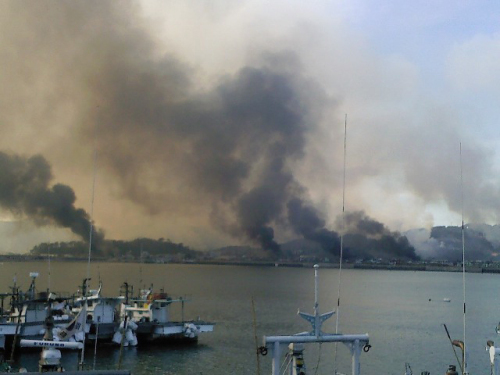 Some of the shells fell on Yeonpyeong, causing several forest fires and setting ablaze some of the houses. The South began firing back at 2:47 p.m.
As the South Korean military launched a “strong, concentrated” counterattack on the North’s coastal bases, a “considerable damage” might have been incurred on the North Korean side, the JCS said. The clash came as the South was carrying out a regular live-fire exercise in waters off Bangnyeong Island and the Yeonpyeong Island. The South Korean military was also conducting the annual nine-day Hoguk Exercise, which began Monday with an aim to enhance defense capabilities against the communist country. In the morning, the North sent a telephone message to the South, saying “The North would not just sit back if the South fired shots into the North Korean territorial waters,” according to JCS officials. Some four hours after it began the firing, the North Korean military claimed through the state-run Koren Central News Agency that the firing was a “countermeasure” in response to the South’s military provocations. “South Korean puppets pushed ahead with its military provocations, firing rounds toward our waters despite our repeated warnings. Our revolutionary forces took stern military measures with instant, strong physical strikes in response to the puppets’ military provocations,” the North Korean military said. The South Korean military has imposed its highest-level alert for local provocations, called “jindogae hana,” and strengthened its readiness posture in all military branches. In the afternoon, JCS Chairman Gen. Han Min-koo and U.S. Forces Korea commander Gen. Walter Sharp held talks through a video teleconferencing and agreed to review the declaration of the joint crisis management posture. Should the posture be declared, the military surveillance and monitoring on the North is to be strengthened. 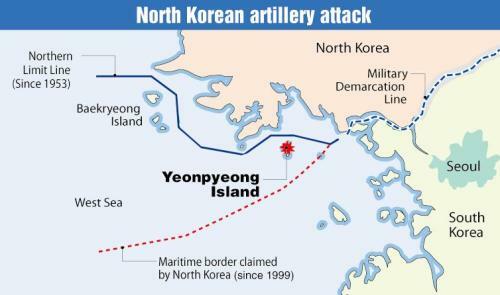 On the Yeonpyeong Island, the military and police staff evacuated residents into a safe zone. The volley of artillery came as tensions have run high between the two Koreas following the March 26 sinking of the corvette Cheonan, which Seoul holds Pyongyang responsible for. The Seoul-led multinational investigation team concluded in May that a North Korean midget submarine torpedoed the 1,200-ton corvette, killing 46 sailors. Pyongyang has persistently denied its involvement. In August, the North fired some 130 coastal artillery shells into waters near the western inter-Korean maritime border. Some 10 coastal artillery shells landed in waters about 1-2 kilometers south of the Northern Limit Line off Bangnyeong Island. The volley of the artillery fire came after the South Korean military finished its five-day maritime maneuvers in the West Sea, which were designed to enhance its defense capabilities against North Korean provocations. Yang Moo-jin, professor at the University of North Korean Studies, said that North Korea could gradually raise its level of provocations in order to raise its bargaining power in negotiations with the U.S.
“After it recently revealed its new uranium enrichment facility, it might have wanted the U.S. to engage in negotiations with it. But South Korea and the U.S. pressured the North with a unified stance and the North Korean military might have felt shunned and ignored,” he said. Some others claimed that the firing appears intended to nullify the Northern Limit Line, a de facto sea border, which the North does not recognize as it was drawn unilaterally by the U.S.-led U.N. Command at the end of the 1950-53 Korean War. The artillery bombardment also came as a surprise as North Korea experts here largely anticipated that the communist state would seek to improve ties with its southern neighbor as it has been striving to solidify its second hereditary power succession. The North has recently made it public that its leader Kim Jong-il’s youngest son Jung-un is being groomed to succeed his ailing father. Jung-un has recently been made a four-star general and appointed as vice chairman of the ruling Worker’s Party’s Central Military Commission.